Queen’s Park was one of the first parts of east Brighton away from the sea to be built up and in 1875 W White designed a modest red brick mission church and school in the parish of St Mary, which was not on the same site as the present church (B 29 p490). It was originally planned with a timber arcade, like that at White’s almost exactly contemporary church of St John, Littlehampton, but this was carried out in stone as timber was for unexplained reasons thought inappropriate (BN 41 (1881) p260). After being used for other purposes, it was only pulled down in 1972 (Elleray (1981) p49). Within a few years, however, it was too small for continued use as a church and by 1879 there were plans to build a permanent one. Land was bought and this was built between 1882 and 1885 by Sir A W Blomfield (GRI) at a cost of £4511 (KD 1899). This is a large flint building with a prominently placed but unfinished octagonal south west tower. 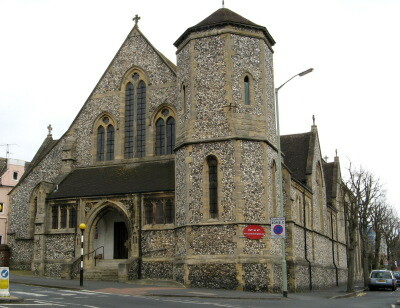 The lack of the intended upper stage, which would presumably have resembled Blomfield’s completed one at Christ Church, St Leonards, makes it unfair to criticise the design. However, the church shows many of Blomfield’s mannerisms, such as the grouped west windows or the five light east one, contained in an arch. Both inside and out, some aisle windows are set in cross-gables, creating fidgety rhythms in walls and roofs. Unexpectedly, the south chapel is taller than the aisle to its west. As often in Blomfield’s work, a redeeming feature is the fine carpentry of the roofs, panelled in the chancel; that of the nave is left open with tiebeams. He was also skilled at creating spacious interiors, barely interrupted by tall chancel arches, of which this is a good example. In 1967 the west bay of the nave was partitioned off as a parish room, thereby giving a foreshortened look to the interior. The architect was probably J R F Daviel of Clayton and Black (BE(E) p158). 2. Octagonal, with arcading on the bowl. 1. (West windows, both tiers) J Powell and Sons, designed by H E Wooldridge (Order book). 2. (East window of south chapel) C E Kempe, 1901, in memory of Queen Victoria. 3. (North aisle, three windows) A L Moore, c1917-19 (one is signed). Pulpit: Stone and arcaded and appears to be an integrated part of the design. Reredos: Arcaded, with paintings of saints. It is incorporated in the base of the east window, so it too is likely to be part of Blomfield’s design. My thanks to Martin Jones for drawing my attention to the change of material for the arcade of White’e church.